The good news is, the incidence of prematurity could be halved (at the very least) by ensuring the Vitamin D status of pregnant mums. Check the graph - courtesy of the researchers at GrassRootsHealth, whose work now spans more than three decades. 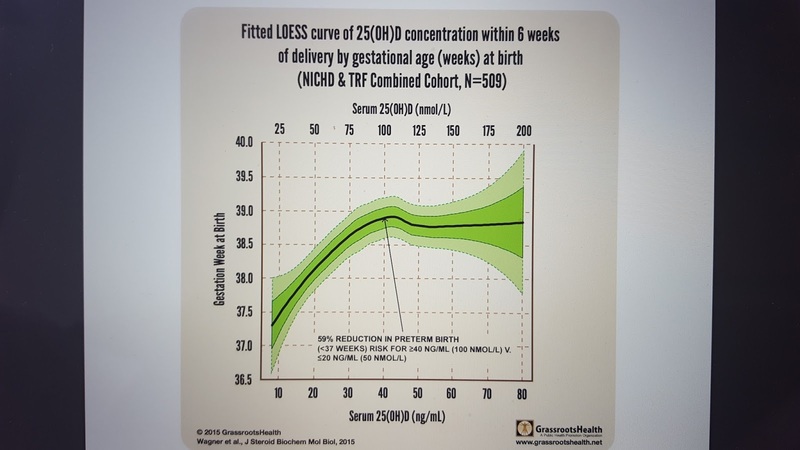 You can see that weeks of gestation (left vertical bar) keeps increasing until the serum level reaches about Serum 25(OH)D 40ng/mL (Serum 25(OH)D 100nmol/L). It’s really that easy - and it’s a free vitamin! It’s manufactured in the body when you get unprotected exposure to sunlight during the peak hours of sunshine! Dose for adults: I,000IU 1 to 2 times daily. Dose for preconception: 2,000 IU daily. The only way to get Vitamin D3 in breast milk is by dosing daily - either by sun, diet or supplementation. Dr. Bruce Hollis, Professor of Pediatrics, College of Medicine, Medical University of South Carolina indicates that 6,400 IU/day is necessary for breast feeding mothers to attain sufficient vitamin D (to the value of 400 IU/day for the infant) in their breast milk. Remember too that the very best time to ensure Mum's optimal Vitamin D status is before conception, while making sure of prospective Dad's status will positively impact his fertility. If you've missed the preconception period, it’s never too late to get your levels into the preferred zone. More on all of the above when you join my free webinar.